"There couldn't be a better way to prepare freshly caught wild brook trout. Serve with a side of creamy mashed potatoes and steamed Swiss chard." Remove gills from fish and discard. Rinse fish under cold water. In shallow dish, combine the flour, cornmeal, salt and pepper. Raise heat to high. 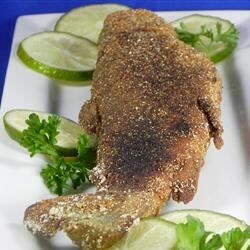 Dredge fish in flour mixture and fry in hot oil for about 4 to 6 minutes on each side or until meat flakes with a fork. Serve garnished with lemon wedges. This is the easiest way to pan fry fish that I can think of. Not only does it work for trout but for many other fish as well. The ingredients are those usually found in the pantry. Very good. The oil started smoking, so I turned down the heat to med. high. I didn't need tarter sauce. Very yummy, and easy.